3-in-1 Design Makes Connections and Setup Neat and Easy. Color-coded Connectors for Easy Installation. 2-in-1 Design Makes Connections and Setup Neat and Easy. Color-coded Connectors for Easy Installation. 3-in-1 single cable connects your PC to your VGA KVM switch. Keep your work area better organized and easy to manage with our color-coded connectors. Linkskey KVM-SC10 is a Hi-Res KVM cable manufactured with three color-coded connectors under one jacket to prevent cables tangling and minimize desktop clutter. Made from premium quality coaxial cable to ensure superior resolution with new and high resolution monitors. Length 10 Foot. for PC. (All Male Type) 1 x HD15 (For Video) 1 x PS/2 (For Keyboard) 1 x PS/2* (For Mouse with adapter) 1 x USB** (For Keyboard and Mouse). Linkskey KVM-SC10 is a Hi-Res KVM cable manufactured with three color-coded connectors under one jacket to prevent cables tangling and minimize desktop clutter. Made from premium quality coaxial cable to ensure superior resolution with new and high resolution monitors. Length 25 Foot. for PC. (All Male Type) 1 x HD15 (For Video) 1 x PS/2 (For Keyboard) 1 x PS/2* (For Mouse with adapter) 1 x USB** (For Keyboard and Mouse). Linkskey KVM-SC10 is a Hi-Res KVM cable manufactured with three color-coded connectors under one jacket to prevent cables tangling and minimize desktop clutter. Made from premium quality coaxial cable to ensure superior resolution with new and high resolution monitors. Length 6 Foot. for PC. (All Male Type) 1 x HD15 (For Video) 1 x PS/2 (For Keyboard) 1 x PS/2* (For Mouse with adapter) 1 x USB** (For Keyboard and Mouse). Ideal for connecting USB Style KVM Switches to the Computer. Premium Quality Cable with Ferrites and Gold Plated Contacts. Made from premium quality coaxial cable to ensure superior resolution with new and high resolution monitors. 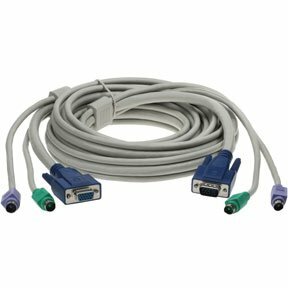 HD15 (SVGA) + USB A-B Cables are used for KVM switches or monitors with built-in USB hubs. You can get quality KVM Cables at SF Cable and get them delivered at your doorsteps. You can choose from KVM Cables with different specifications, KVM combo cables, Universal KVM Cables, KVM Extension Cables, Universal KVM Extension Cables, and many more products. You can rely on the quality and safety of the products as SF Cable is sincerely working towards making customer satisfaction from the products better. You get good after sales service and lifetime technical support on all our products.